This is the second of two series profiling Millennials. Last series explored demographically how the Millennials have altered the population, income, education, and household characteristics of young adults. This series delves into Millennial home buying trends, shopping attitudes and habits and whether they lend themselves to home furnishings purchases in the future. Millennials, ages approximately 17 to 34, represent the largest generational cohort in history with numbers exceeding 83 million. 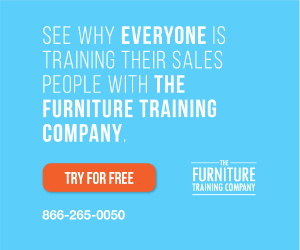 Due to high unemployment rates, lower marriage rates, and a fallen median income, Millennials are arriving late to the home buying industry and in turn the home furnishings industry. But studies show many Millennials actually would prefer to own rather than rent, but opportunity and financial barriers are hindering them. These first-time home buyers have been sitting out the housing recovery largely because of financial reasons. The Great Recession ushered in a poor job market and the first factoid in this series shows the rising percentage of graduates with college debt. According to The Institute for College Access and Success (TICAS) Project on Student Debt, the graduates with debt grew from 65 percent in 2004 to 69 percent in 2014 to an average of $28,000. In fact, the Census Bureau reports that one in five young adults is living in poverty, up from one in seven in 1980. The next factoid will show the slow to rise median income among Millennials and how that has added to a delay in what should become an influx of young adults buying homes. 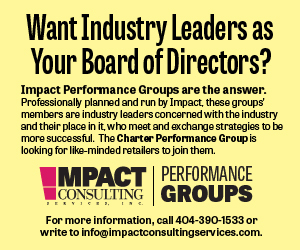 Source: Impact Consulting Services, Inc. industry model. 2015 Q4 and 2016 Q1 sales have been revised. Second quarter year-to-date Bedding sales totaled $6.86 billion, up only 1.8 percent from the same period last year. Source: Impact Consulting Services, Inc. industry model. 2015Q4 and 2016 Q1 sales have been revised. Industry sales slowed in the second quarter to 2.3 percent growth compared to Q2 of last year and only 1.5 percent growth over the first quarter of this year. Total furniture and bedding sales totaled $23.5 billion. Year-to-date through the second quarter, the industry grew at 3.5 percent. Furniture (excluding Bedding) in the second quarter increased 2.4 percent compared to the same quarter last year totaling $20.08 billion. Compared to the first quarter of this year, furniture only sales are up 1.9 percent. Year-to-date furniture sales (excluding Bedding) are up 3.7 percent. Industry sales are still growing, but at a slower pace, as shown by the chart above. For the third straight quarter since 2015 Q3, quarter-over-quarter industry performance has slowed. Second quarter combined Furniture and Bedding industry sales of $23.5 billion were a modest 2.3 percent improvement over the same Q2 in 2015. Compared to last quarter (2016 Q1) sales increased 1.5 percent. Furniture (excluding Bedding) increased 2.4 percent in 2016 Q2 versus the same quarter last year with sales of $20.08 billion. Bedding quarter-over-quarter sales totaled $3.42 billion, up 2.0 percent over second quarter sales last year. Year-to-date industry sales in the second quarter of 2016 totaled $46.65 billion, an increase of 3.5 percent over the same period last year. This is the third factoid in a series of five factoids that explore demographically how the Millennials have altered the population, income, education and household characteristics of both the Under 25 and 25 to 34 age groups over a ten-year period. Millennials, Americans born roughly between 1982 and 2000, account for more than one quarter of the nation’s population. As of 2015, these 17 to 34 year olds numbered 83.1 million and have surpassed the 75.4 million Baby Boomers. The percentage of Millennials that are college educated is higher than any generation preceding it, a fact that should bode well for future economic growth. Over seventy percent of Millennials have some higher education; a much higher percentage than their Boomer parents. Despite the level of education, a staggering number of Millennials are still looking for work. At the end of last year, 9.4 percent of adults ages 20 to 24 seeking jobs were still unemployed. The next factoid will detail the delays in marriage and home buying among Millennials. This is the fourth factoid in a series of five factoids that explore demographically how the Millennials have altered the population, income, education and household characteristics of both the Under 25 and 25 to 34 age groups over a ten-year period. Millennials, Americans born roughly between 1982 and 2000, account for more than one quarter of the nation’s population. As of 2015, these 17 to 34 year olds numbered 83.1 million and have surpassed the 75.4 million Baby Boomers. Of all of the characteristics of Millennials, perhaps none is more significant to the home furnishings industry than the tendency to delay marriage. In less than ten years, the marriage rate shifted from 38 percent of adults marrying by age 34 to only 26.8 percent. Marriage spurs home ownership and family planning which in turn feeds the home furnishings industry. Although Millennials make up the largest and most educated generation in American history, the combination of economic factors, delayed marriage and family formations and shifting consumer attitudes also make them the slowest to embrace home ownership. This is most evident in the 25 to 34 age group where home ownership has fallen 10 percentage points in 10 years. In 2004, 49 percent of Millennials owned their own homes compared to 39 percent in 2014. The final factoid will show the state of both furniture expenditures and industry sales across all age groups. This is the final factoid in a series of five factoids that explore demographically how the Millennials have altered the population, income, education and household characteristics of both the Under 25 and 25 to 34 age groups over a ten-year period. Millennials, Americans born roughly between 1982 and 2000, account for more than one quarter of the nation’s population. As of 2015, these 17 to 34 year olds numbered 83.1 million and have surpassed the 75.4 million Baby Boomers. The glut of the Millennials, the Under 25 age group, is one of the few groups to increase expenditures on furniture in the last 10 years, although expenditures still comprise only about 5 percent of industry sales. Many of these Millennials, however, still rely heavily on family financial support. Millennials ages 25 to 34 as well as the older GenX 35 to 44 group, traditionally the core of the furniture industry, have both failed to reach pre-recession furniture expenditures – down 8.2 percent and 12.3 percent. For the home furnishings industry, the Millennials always seem to be just over the horizon but yet to make their big entrance. In terms of furniture industry sales, sales to the Baby Boomers are still growing, but they will begin to lessen their impact and make way for the Millennials. 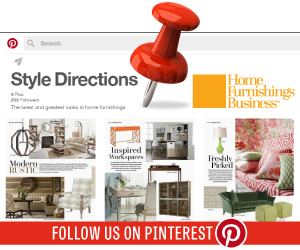 Many things add up to help explain the slow arrival of the Millennials on the home furnishings consumer scene. The long recovery from the recession brought stagnant wages and higher unemployment. Add to that the delaying of marriage and slow home purchases. But the industry is ready. Source: U.S. Census Bureau, Consumer Expenditure Survey. Note: Expenditures by the CES survey are generally significantly lower than the Personal Expenditure Survey conducted by the Bureau of Economic Analysis and may not include all furniture purchases. This is the second factoid in a series of five factoids that explore demographically how the Millennials have altered the population, income, education and household characteristics of both the Under 25 and 25 to 34 age groups over a ten-year period. Millennials, Americans born roughly between 1982 and 2000, account for more than one quarter of the nation’s population. As of 2015, these 17 to 34 year olds numbered 83.1 million and have surpassed the 75.4 million Baby Boomers. The economy has had a major impact on Millennials. Many of them still live with their parents, have crushing student loan debt and are underemployed at best and unemployed at worst. Over the past ten years individual incomes have yet to reach pre-recession levels. 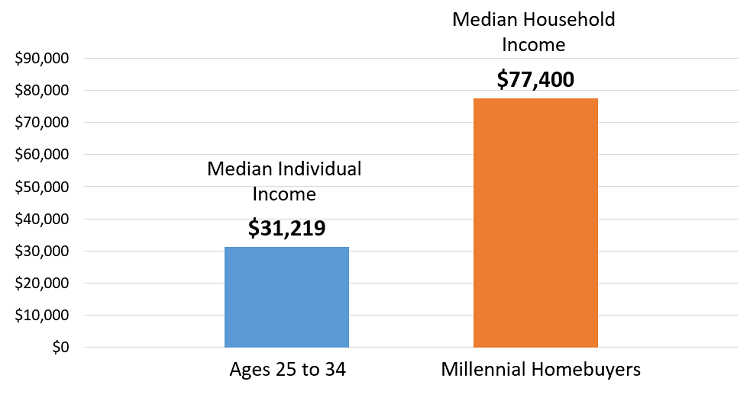 Latest median income figures from the Census Bureau report Millennials ages 25 to 34 earn $31,219 annually, down over 10 percent from a peak of $34,459 in 2007. Many of the Under 25 age group Millennials are currently part-time employed college students, underemployed graduates or workers in unskilled low paying jobs. The next factoid will show that while the Millennials are the most college-educated generation thus far, an overwhelming number of young adults are still looking for work. This is the first factoid in a series of five factoids that explore demographically how the Millennials have altered the population, income, education and household characteristics of both the Under 25 and 25 to 34 age groups over a ten-year period. Millennials, Americans born roughly between 1982 and 2000, account for more than one quarter of the nation’s population. As of 2015, these 17 to 34 year olds numbered 83.1 million and have surpassed the 75.4 million Baby Boomers. The Millennial generation continues to grow as young immigrants move into the U.S., while deaths among Baby Boomers exceed the number of older immigrants. These children of the Boomers will emerge into full adulthood in 2017 as the largest consumer generation in history. As a whole, the number of 15 to 34 year olds has grown 9.5 percent from 2004 to 2014 (most recent population data). As shown in Table A, the glut of Millennials is in the 20 to 24 age group – totaling 22.9 million in 2014 after jumping 12.6 percent in ten years. Ages 25 to 29 have also grown dramatically, increasing 15.7 percent from 19 million to 22 million. While dipping down to 19 million in 2008, age group 30 to 34 has climbed up to 21.5 million. The Millennial stragglers are in the top end of the 15 to 19 age group. Once the highest young adult population in 2006 and 2007, most have since aged into their twenties leaving this age group relatively flat at a 3.7 percent growth over the ten-year period. This is the final factoid in a series of five factoids exploring the possible connection between election years and a healthy economy. The previous four factoids studied the positive effect election years have had on furniture sales, consumer confidence, gross domestic product and unemployment rates from 1997 to 2016. During the 80s and 90s, with the exception of Ronald Reagan’s second term, the first year of a president’s four-year term experienced higher furniture industry growth than the previous election year. In recent elections, the economic momentum of the election year did not carry over to the first year of a presidency. No president’s first year of the term exceeded the previous election year’s growth. If this trend continues into 2017, the Furniture Industry will not experience quite the growth of 2016. This is the fourth factoid in a series of five factoids exploring the possible connection between election years and a healthy economy. Looking back over the past 20 years and the elections those years encompassed yields interesting results. With the exception of the Great Recession in 2008, a possible heightened sense of confidence and hope for the future during election years may partly be responsible for higher furniture sales growth, consumer confidence, gross domestic product and lower unemployment rates. Like the highs in Consumer Confidence, the Unemployment Rate was at its lowest during the Bill Clinton years. The Great Recession caused the unemployment rate to skyrocket near 10 percent, but by the election year of 2012, the rate has decreased to 8.1 percent and continues to fall almost a percentage point each year. Currently at 4.9, the Unemployment Rate looks to be continuing the trend of other election years with the lowest unemployment of the presidential term. While the majority of election years in recent times have ended on a positive economic note for the furniture industry, did the momentum carry over to the first year of a president’s new term? The final factoid of this series will compare election years to the 1st year of a president’s term. This is the third factoid in a series of five factoids exploring the possible connection between election years and a healthy economy. Looking back over the past 20 years and the elections those years encompassed yields interesting results. With the exception of the Great Recession in 2008, a possible heightened sense of confidence and hope for the future during election years may partly be responsible for higher furniture sales growth, consumer confidence, gross domestic product and lower unemployment rates. The Gross Domestic Product or GDP is defined as the monetary value of all the finished goods and services produced within a country’s borders in a specific time period. The GDP has made its largest gains during election years with the exception of the Great Recession. In both Bill Clinton’s 2nd term and George W. Bush’s 1st term, the value of U.S. goods and services increased by more than 6.5 percent from the previous year. It remains to be seen whether 2016 will follow the same trajectory. The fourth factoid of this series will show the drop in unemployment rates during election years.